If you’re like millions of other Americans you might find yourself asking questions like, “what is cottonmouth”, “what does cottonmouth feel like”, “what are the signs and symptoms of cottonmouth”, or “what are the causes and side effects of cottonmouth?”. Cottonmouth, otherwise known as dry mouth or xerostomia occurs when your body doesn’t naturally produce enough saliva. Cottonmouth can be brought on naturally or through food or substances we consume in our daily lives. Leave a sticky or dry feeling in your mouth. Make talking or swallowing difficult. Lead to issues like bad breath, tooth decay, and gingivitis. It’s an uncomfortable situation that affects millions of people all over the world every day. Unfortunately, cottonmouth can be a regularly occurring issue or a temporary experience, it just depends on the person, their body, and what they’re consuming. Stress, medications, nerves, food or drugs are a few causes that can bring on the feeling of cottonmouth because they can all slow down your saliva production and bring on that dry, cottonmouth sensation. Think about a water slide without water running through it. Kind of ruins the whole experience. It’s the same when someone experiences cottonmouth symptoms and can be very debilitating. 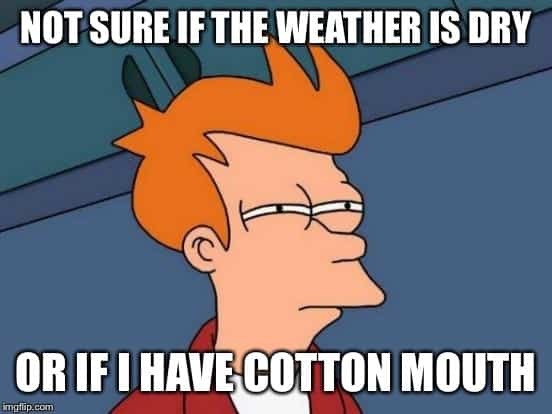 The ADA or American Dental Association defines cottonmouth, dry mouth, or xerostomia (the fancy clinical term) as a state when your body develops an issue with keeping up saliva flow or saliva production. The salivary glands for whatever reason begin to slow down saliva production and this is what gives you the dry, parched feeling that can make life very uncomfortable and awkward at times. Proper saliva production is important because it plays several roles in good oral health. What Does Cottonmouth Feel Like? Cottonmouth is described as an unpleasant, dry, or parched feeling in your mouth, on your tongue and down into your throat. Because cottonmouth affects everyone differently, we all feel varying sensations. The most common feelings associated with cottonmouth are a burning sensation in your throat or as if you’re stuffing cotton balls in your mouth. Or if you’re a movie buff, think of the sand monster from The Mummy. What Are The Signs & Symptoms Of Cottonmouth? Cottonmouth can feel like many different things depending on the person and the issue they have with saliva production. What Are The Causes Of Cottonmouth? There are many causes or reasons that we get cottonmouth. Daily activities like eating or smoking can reduce saliva flow. In addition to that, it could be a medicinal side effect or a personal health reason as to why you’re getting a dry, cottonmouth feeling. In addition, many muscle relaxants and sedatives are also known to increase the feeling of cottonmouth and exacerbate cottonmouth symptoms. If you think there are medications you’re taking that could be contributing to cottonmouth, consult with your doctor. What Are the Side Effects of Cottonmouth? As uncomfortable as cottonmouth is, it can also lead to more serious oral health side effects. — will all help alleviate some cottonmouth side effects. What Are Some Ways To Relieve Cottonmouth? If you’ve decided that your cottonmouth is brought on by some of your daily activities or lifestyle choices, try to cut back to improve your cottonmouth signs and symptoms. Consistently drinking water and staying hydrated through the day can also help relieve cottonmouth, especially during meals. An increase in water intake will aid saliva production in your mouth and help you to chew and swallow your food. SmartMouth is the only dry mouth mouthwash proven to temporarily relieve dry mouth and eliminate and prevent bad breath for 12 hours with every rinse. 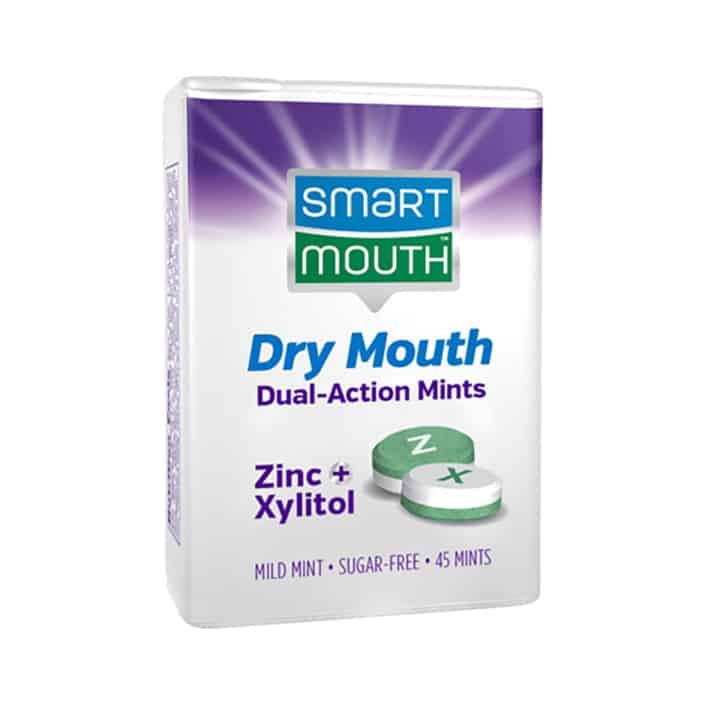 Know that SmartMouth Dry Mouth Products are the answer. SmartMouth Gives to Local Food Bank What Is Halitosis? What Are The Causes?